1939 Bermuda style kitchen remodel. Function!!!! In meeting with the homeowners, this was the first thing that they asked to be addressed. The house was built in 1939 in the Bermuda style that was very much in vogue at the time. The galley kitchen was original and had never been remodeled. It was built before dishwashers, microwaves and the hoods that we take for granted today. We had to address how to incorporate these items into the space while keeping the original style. Most people ask me to help design a totally new kitchen for them. These homeowners love the Bermuda style of their house and wanted to stay true to the period and quality materials and finishes as much as possible. They loved the functionality of the original solid wood cabinets and simple cabinet fronts and wanted to retain as much of the original cabinetry as possible. The base cabinet run along the wall with the window was not deep enough to incorporate a dishwasher and the sink cabinet was deteriorated. This set of base cabinets had to be replaced. The wall cabinets would remain and we had custom base cabinets made to match, including the bread boards. The dishwasher, to the right of the sink, has a wood panel to match the door style and a “bread board” as a handle to keep the original detail. The tall pantry cabinet at the end was also increased in depth to match the width of the new base cabinet run and maximize storage. The two porcelain sinks were replaced with a new extra deep under mount double sink. The wall faucet was replaced with a Chicago wall faucet to keep that original look. A restaurant equipment sourced water dispenser was added to the right of the faucet for filtered water. On the opposite wall, the 48” Viking range was to remain. To address the function issue on this side, we replaced the original ceiling exhaust fan with a 48” stainless hood with new cabinets above and on the right side. This provided the lighting and ventilation needed, as well as more storage. New brushed nickel knobs with an integrated “earthquake” latch were installed on all cabinets. With the main function issues resolved, we looked at finish materials. The homeowners were torn between keeping traditional tile countertops and backsplash or incorporating a new material that was easier to clean and maintain. 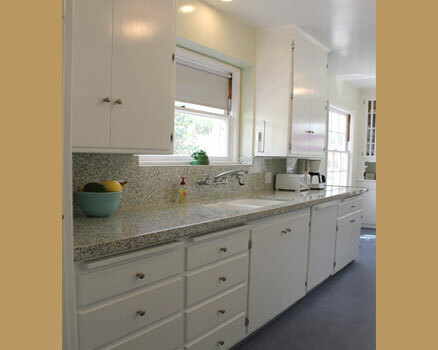 The countertop material chosen is quartz composite with glass chips of various colors. The front edge on the sink side has a raised lip, similar to the original tile edge. This colorful “bottle glass” material was also used on the backsplash for design continuity. The original display cabinets on either side of the front window had a bench seat under the window. This was replaced with a taller cabinet with drawers and the same bottle glass countertop. As you turn the corner, to the right of these cabinets was a 32” wide pocket door leading to the dining room. This opening was widened to 48” and two period pocket doors were installed with the louver design, matching existing doors into the dining room from the opposite side. This creates a better flow between the dining room and kitchen for their large gatherings. The original 1939 flooring had been green linoleum. They wanted a flooring treatment true to the period of the house. After looking at several products and samples, the muted blue linoleum was selected to pick up the blue glass in the countertops. The walls are painted green tea, a light green, another color of the glass chips in the countertops. To keep the two original glass ceiling light fixtures, they were updated with LED bulbs. A new LED recessed light fixture was installed above the sink. The result is a more functional kitchen that is in keeping with the original 1939 Bermuda style character of the house. MDB Design Group will create innovative design solutions that relates to the home owner’s vision while maintaining a balance between functionality and aesthetics.